evo’s new master does as it pleases! 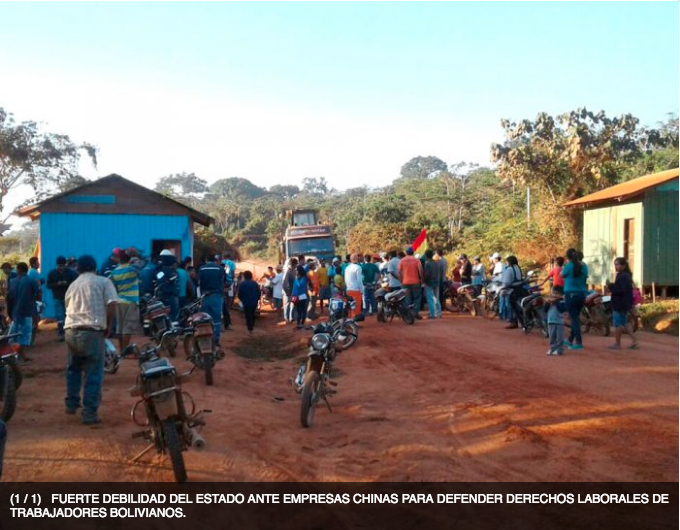 Bolivian Labor and Environment under peril by China! Several Chinese companies were reported to the government authorities about the recurrent breach of labor laws in Bolivia by Chinese citizens. In many cases, such as the one in Chuquisaca, where Asian personnel have exercised violent actions against workers, the same applies to environmental preservation. According to research by the Center for Labor and Agrarian Development Studies (Cedla), the presence of transnational capital from China had been consolidated in the country given that it is the first bilateral credit creditor and the import supplier that sharpens the trade balance. While highlighting the flexibility of Chinese credits, they also refer to their disadvantages economic experts and documents produced by universities in Europe and the United States, including the Inter-American Dialogue and the Global Economic Governance Initiative in Boston and the Washington Center for Inter-American Dialogue Studies . An article by Andrés Oppenheimer, published in the New Herald, noted that the study of the Inter-American Dialogue and the Global Economic Governance Initiative at Boston University maintains that Chinese banks lent Latin American countries $22 billion until 2014, accumulating total loans of $119 billion dollars to the region since 2005. Meanwhile in the document: The Chinese presence in Bolivia, why the interest in one of the smallest economic sectors in the region?, by Cedla, it was pointed out that the fall in savings, as a result of the decrease in prices of oil and minerals, led the Bolivian government to greater dependence on external financing from borrowing to boost investments. This entry was posted in Bolivia, Business, Economics, Environment, Politics, Social Unrest and tagged corruption in public office, demagogue, environmental damage, government failures, labor. Bookmark the permalink.